Gold grilles are so fetch in the Middle East. Nissan has just released the 2012 Nissan GT-R VVIP edition and it, well, looks familiar except for one thing - plenty of gold. Available only in the Middle East, the VVIP is basically the European GT-R Egoist trim save the added 24-karat gold. Updated for the 2012 Nissan GT-R, the VVIP edition utilizes a revamped 550hp GT-R engine and plenty of personalization options (including 12 leather color options to choose from) to ensure that your own, exclusive Godzilla won&apos;t resemble anyone else&apos;s.
What is standard, however, in the pricy GT-R is a dealer-installed gold-plated front grille, side panels and distinct "VVIP" badging. An exclusive Bose sound system ensures you can bump some beats while cruising around with all that bling. No real performance upgrades have been added, however it does include a ceramic brake package along with a titanium exhaust. The 2012 Nissan GT-R VVIP edition is available for order now at select Nissan dealers in Saudi Arabia, Dubai, Abu Dhabi and Qatar. Pricing is set at over twice the MSRP, running a - deep breath - $266,000 (Dh977,000). 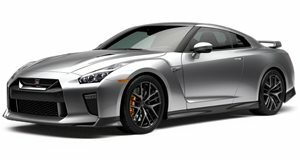 2017 Nissan GT-R First Look Review: Can We Now Start Calling It A Supercar? A new interior really makes this thing more desirable to rich people.